Global Domains International, Inc., (www.WebSite.ws) based in Carlsbad, CA, has been named one of America's entrepreneurial growth leaders by Inc magazine, which today released its 2002 Inc 500 ranking of the nation's fastest-growing private companies. The ranking will appear in the magazine's special Inc 500 issue, which hits newsstands on October 15. Global Domains International achieved 3479% growth in the past five years, ranking #37 on the list of 500 fastest growing companies in the United States, #5 in California, and #2 in San Diego with sales growing from $261,000 in 1997 to $9,341,000 in 2001. GDI (www.WebSite.ws) offers the global solution to registering Internet addresses with the .ws "web site" top-level domain extension for business and personal web sites. The company is committed to offering an easy and affordable solution to registering useful and memorable Internet addresses. Registrants of .ws "web site" domains include individuals, small businesses and major corporations throughout the world in over 180 countries and include such notable companies as Yahoo (NASDAQ: YHOO), Intel (NASDAQ: INTC), Cisco Systems, Inc. (NASDAQ: CSCO) and AT&T (NYSE: T). Growth in the .ws "web site" domain namespace is stronger on a percentage basis than .com domain names and is poised to become an international standard for Internet addresses globally. "It is exciting and gratifying to be included in Inc magazine's extremely prestigious ranking," said Michael Starr, GDI's Co-Founder and CEO. "It shows the spectacular results that may be achieved through focus and teamwork. Earning the number 37 spot out of the 500 fastest growing companies in the USA is a fantastic achievement for us." Started in 1982, the Inc 500 ranks the nation's leading entrepreneurial firms according to sales growth over the previous five years. Former Inc 500 companies that have gone on to become household names include Microsoft, Timberland, Domino's Pizza and Patagonia. The average five-year growth rate of this year's Inc 500 companies is 1,521%. While that is less than the 1,933% average for companies on last year's list, it is nonetheless dramatic in the current environment. 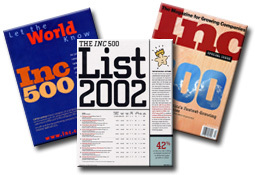 Average 2001 sales for the Inc 500 dropped only slightly, from $24,976,000. More than two-thirds (73%) of the 2002 Inc 500 companies are profitable. Despite the technology bust, "Computer Software & Services" remains the leading industry category, representing nearly 40% of the firms on the list. "This is the first Inc 500 ranking to reflect the full impact of the recession," said Inc editor John Koten. "Yet these entrepreneurs are managing to confound the naysayers and move ahead despite the obstacles. They're showing the smart strategies can succeed even in the toughest of times." To be eligible for this year's Inc 500, companies had to be independent and privately held through their fiscal year 2001, have at least $200,000 in sales in the base year of 1997, and their 2001 sales had to have exceeded 2000 sales. Holding companies, regulated banks and utilities are not eligible. Inc verifies all information using tax forms and financial statements from certified public accountants and by conducting interviews with company officials. Inc, the premier magazine for growing companies, may be accessed online at www.inc.com. WebSite.ws is a registered trademark of Global Domains International, Inc., a privately held corporation.